So you’ve spent the time and effort to come out with a brand new product that’s one of a kind and particularly special in the market. Well unless you have the strongest copyright laws, legal team, and patents then prepare for the inherent evil that will soon come along; the knockoff. Yes as soon as this great new product hits the market you are sure to be facing a slew of cheaply made imitations from all over the world. Now this isn’t always a huge problem as long as you can identify yourself as the original and far superior to any knockoffs that may be present in the market; but that isn’t always the case. Now you may be asking yourself what this has to do with surveillance and why is it present on a security blog. The answer is rather simple because it is an issue that we face in the surveillance world all the time both as distributors of CCTV products and as customers buying these products. At ICU (Industrial Covert Unlimited) we have the challenge of making sure to find the products that our customers are going to want and need and make sure they are affordable. Well in this search we face many different manufacturers selling very identical products with sometimes huge variances in price; the usual reason for this has to do with the general quality of the product and the large selection of imitations that they are offering. 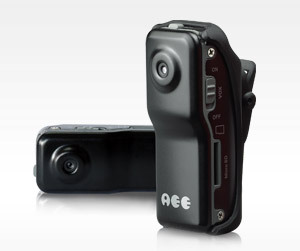 An example we can give relates to a particular product we offer by the name of the G-DV80 thumb sized digital active camera. This product is a rather unique and special little clip security camera that can be used rather covertly for recording decent quality surveillance video. Now when we first started selling this camera it was a one of a kind product with a special place in our product lineup, but unfortunately that didn’t last for long. Within months we began to see multitudes of this very camera spring up on eBay under many different product numbers and names; most of which were also selling at a fraction of what we had to sell ours at. Curious as to how this was possible we purchased a couple of these eBay knockoffs in an attempt to determine how they could be offered at such a lower price than our original. The answer to this was quite an obvious and simple one; poor quality. When these items arrived they were badly packaged and almost loosely roaming around in the package. Furthermore the construction of the product was made of a cheap and easily breakable plastic along with loosely attached buttons and outer features that didn’t work half the time. Ultimately it occurred to us that they could sell these products at a third of our price because they were easily only a third of the quality that ours provided. So in the end remember that just because an imitation product is significantly lower in price than its feature equivalent counterpart; it doesn’t mean its the better deal. So we urge consumers to take the time and do the research before they buy; lest you wish to promote headaches and stress over a low quality item after purchase.